ToneLib ZOOM is an application that is compatible with some ZOOM effect pedals (see the Supported Devices list). Using this app, you can manipulate the pedal’s effects through your computer. The On/Off status and parameter settings of each effect are stored as "Patches." Use the patches to recall and save effects. 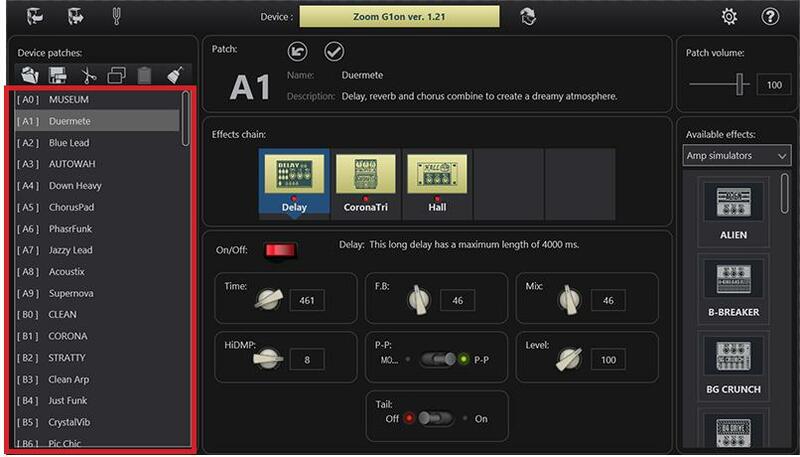 Download the ToneLib ZOOM from our website for the operating system that you are using. Follow the instructions that appear on screen to install the ToneLib ZOOM on the computer. 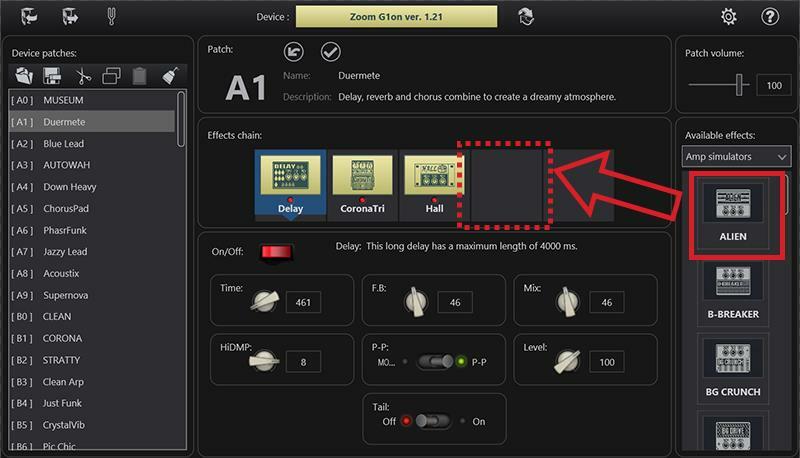 Click the ToneLib ZOOM icon and launch the application. Power on your Zoom device and check the firmware version on the boot screen. Use a USB cable to connect the supported Zoom device ( see list on right ) to your computer. If you connect to a USB port that is different from the one that you used when installing the Windows standard driver previously, "Driver Software Installation" window will appear. After a short time, the standard driver installation will complete. The editor for the connected device will appear. Undoing/Apply the last change to a patch. Patch volume panel ( only G1x and B1x pedals ). 1. Click the patch that you want to edit. 2. 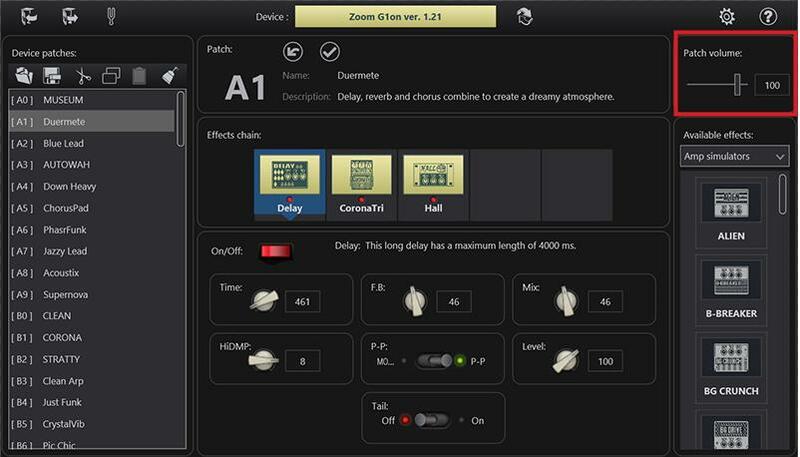 Edit the patch name and description on the 'Patch' panel. 3. 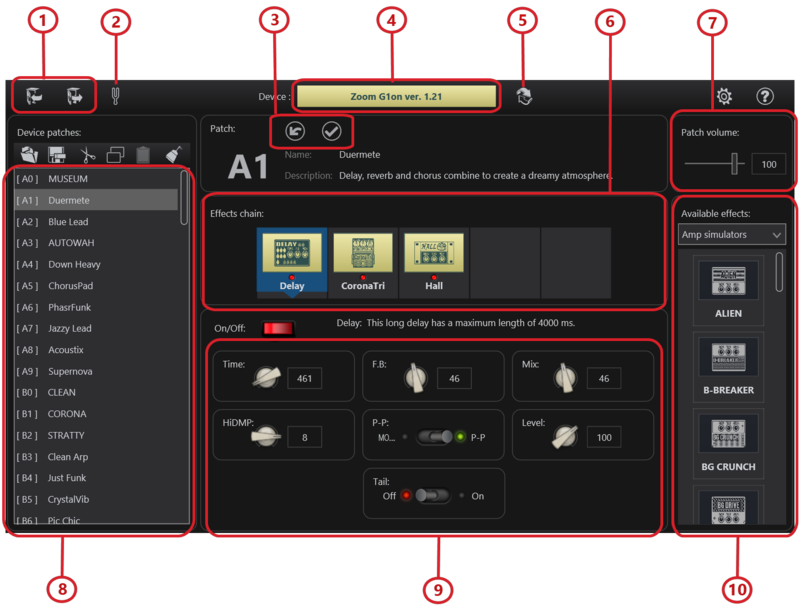 Drag and drop the effect that you want from the 'Available effects' panel to the "Effects chain" panel. 4. Specify the placement of the effects on the "Effects chain" panel by dragging and dropping existing effects. 5. Remove effects by dragging them out of the “Effects chain” panel. 6. Click the ON / OFF button to toggle the effect activity. 7. Edit the selected effect settings. 8. Adjust a patch volume (if available). 9. You can always undo the changes if you are not happy with the sound.